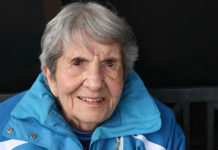 Hudson – Jean M. (Moore) Vieira, 89, a longtime resident of Hudson, died Friday June 17, 2011, at Bolton Manor Nursing and Rehabilitation Center in Marlborough. She was the beloved wife of the late Alfred E. Vieira, who died in 1990. Born in Vanceboro, Maine, the daughter of the late Marvin and Bertha (Beers) Moore, she attended local schools and was a graduate of Vanceboro High School in Maine. She was a veteran of World War II, serving in the U.S. Army Air Forces, and was employed as a programmer by the Raytheon Company for many years until her retirement. She is survived by her brother, Calvin Moore Sr. of Hudson; several nieces and nephews; and her very good friends, the Nicewicz family of Bolton. Calling hours will be held Monday June 20, from 5 to 7 p.m., at the Tighe-Hamilton Funeral Home, Inc., 50 Central St., Hudson, followed by a funeral service in the funeral home. Burial with military honors will be held at a later date in Forestvale Cemetery of Hudson. For online condolences, please visit www.tighehamilton.com.